Submitted. A woman who has “walked in two worlds” will share her insight as part of the President’s Leadership Lecture Series at UFV. Cecelia Reekie will speak at the Abbotsford campus on Wed, Oct 11, at 6 pm in the Student Union Building. Admission is free and the public is welcome. Cecelia Reekie of Langley is a proud member of the Haisla Nation who visits schools as a cultural presenter. But as a child and young woman, she was not strongly connected to her culture or history. Like many Aboriginal children in the 1960s, Reekie was adopted by a white family, and was raised as the daughter of a United Church minister and a teacher, only vaguely aware of her heritage. “I wasn’t part of the Sixties Scoop where so many were taken from their families. My journey was a slightly different one. But I shared similar experiences to those who were,” she notes. When she grew up and had a family of her own, the pull to find her birth parents became strong enough to act on it. Her adoptive parents were supportive of her quest. At the age of 26, she found her birth mother, who revealed the identity of her birth father, who is a member of the Haisla Nation from Kitamaat. 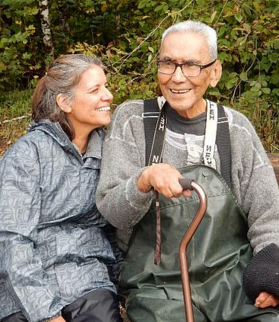 When Reekie reunited with her birth father, she began to learn about the Indian residential school experience and the damage it did. Part of Reekie’s reconciliation journey was volunteering for the Truth and Reconciliation Commission events when the TRC visited Vancouver. She invited her birth father to come along and he did, at first as an observer. But he was moved by what his fellow survivors were sharing, and decided to testify himself. When the TRC held its closing event in Ottawa, Reekie attended, coming full circle from a child raised in the United Church, to an adult reconciling with the damage that the actions of church and state inflicted on her family. Reekie’s UFV President’s Leadership Lecture Series presentation is connected to the ongoing Witness Blanket exhibit. The Witness Blanket, created by master carver and Kwagiulth artist Carey Newman (Ha-yalth-kingeme), is on display at UFV until Nov 8. The Witness Blanket installation incorporates images from the residential school era, as well as items reclaimed from, and actual pieces of, residential schools, churches, government buildings, and traditional structures across Canada.